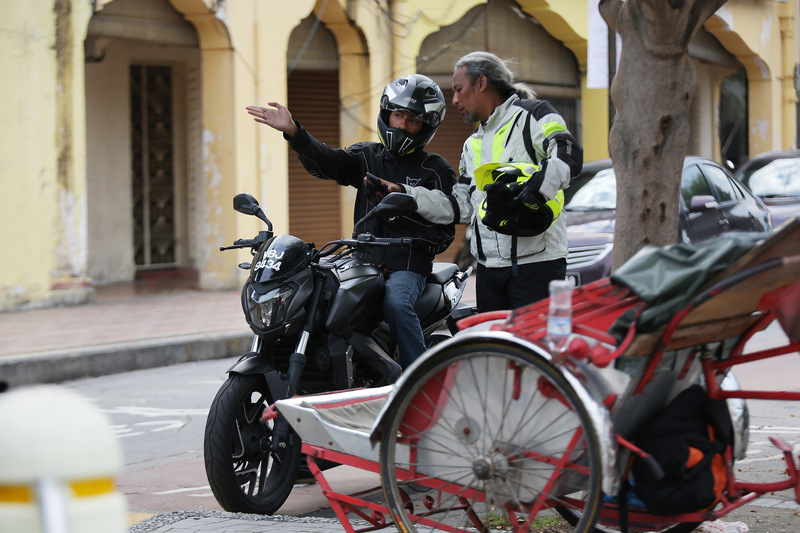 A short journey with my son Adam to explore the delicious food that Malaysia has to offer. 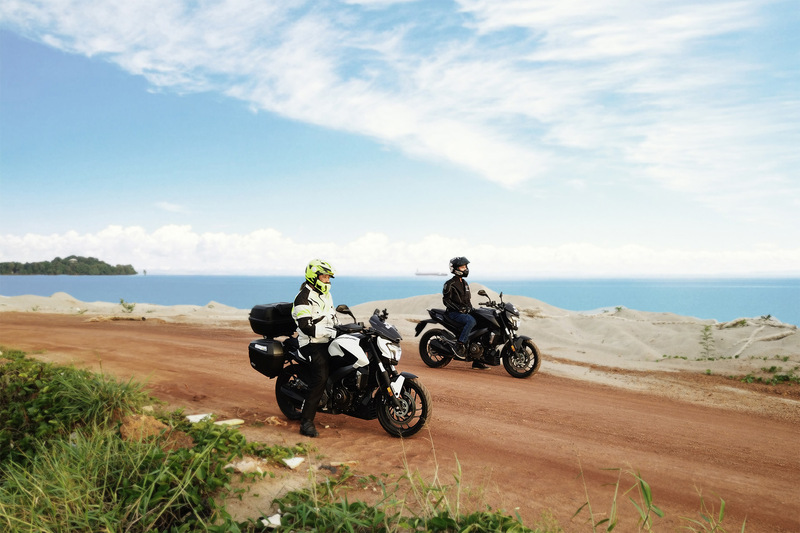 We began down south in Johor and worked our way up north to Langkawi. A quick pit stop for a light show at Puteri Harbour, home of Johor’s award-winning family attractions before we call it a night. Away from the city centre and onto blue skies and calm waters at Pantai Klebang, a local family beach. We were hypnotised by the horizons the whole time! Digging into our deeelicious dishes at Asam Pedas Power Abang Piee for dinner. This is definitely our favourite time of the day! After a good nights rest, we’re off to the historically-rich state of Melaka. Food, culture, and historical sites, here we come! Stability, check. Speed, check. Comfort, check. 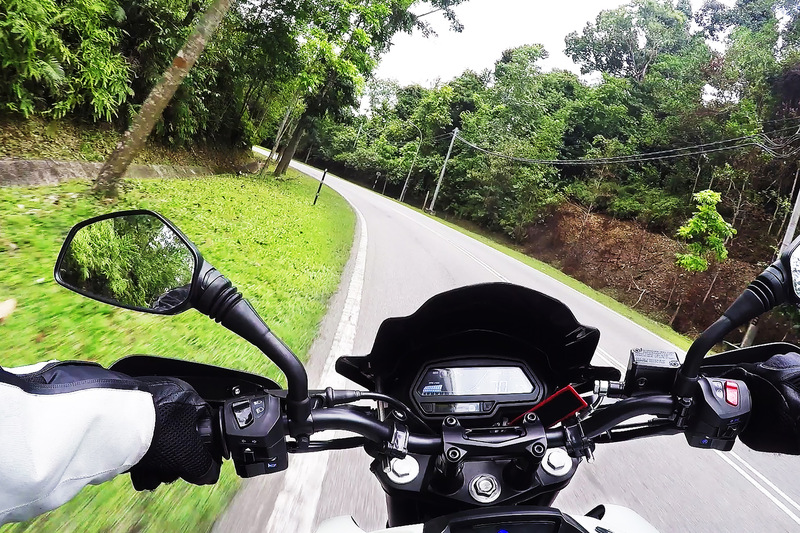 Taking these sharp turns on our Dominar D400 tour motorcycle has never felt this smooth! 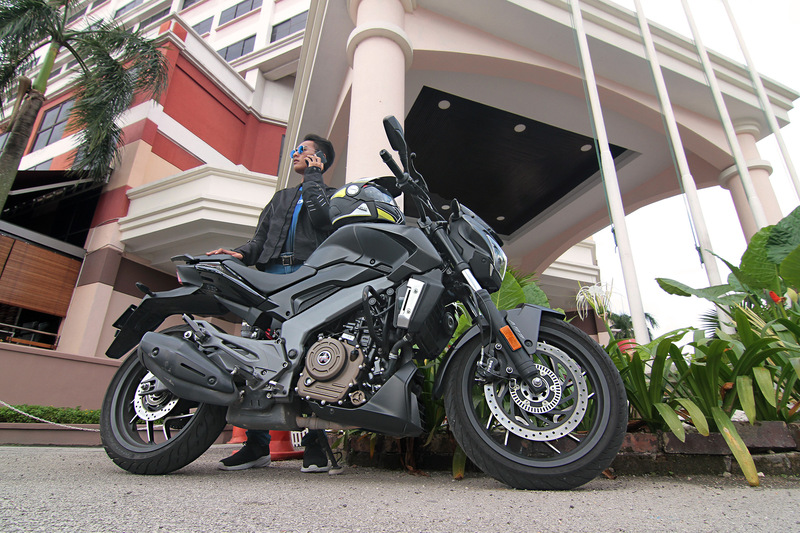 Bring on the twisty roads, Negeri Sembilan. There is something about Semenyih Dam. Filled with the sound of buzzing insects and thick with rich, smells of lush green forests, it has a cathartic effect. All that sightseeing and dancing worked up our appetite. Makan Time is now in session at Restoran Selera Nogori! We had a wide variety of authentic and tasty Malay dishes here. 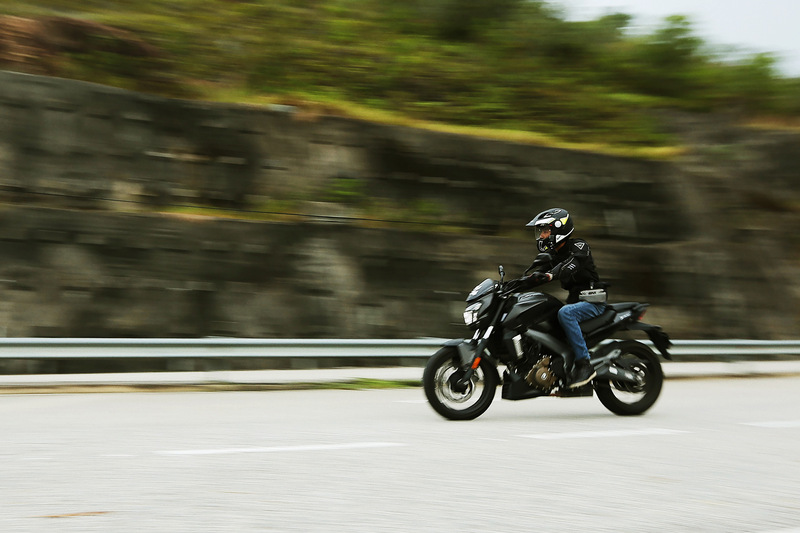 While on the move, I managed to get this cool shot of Adam revving up his Dominar D400 sport-tourer along Kuala Kubu Baru. Smooth journey until we get to the next world famous destination! Touchdown at the Sultan Salahuddin Abdul Aziz Mosque in Selangor! 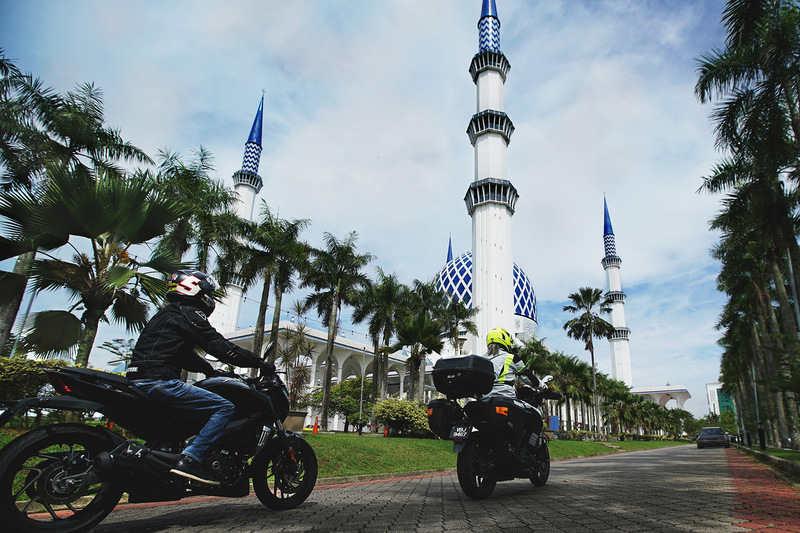 This beauty is largest mosque in Malaysia and the second largest mosque in South East Asia. Simply breath-taking. Capturing our journey in pictures rather than miles. 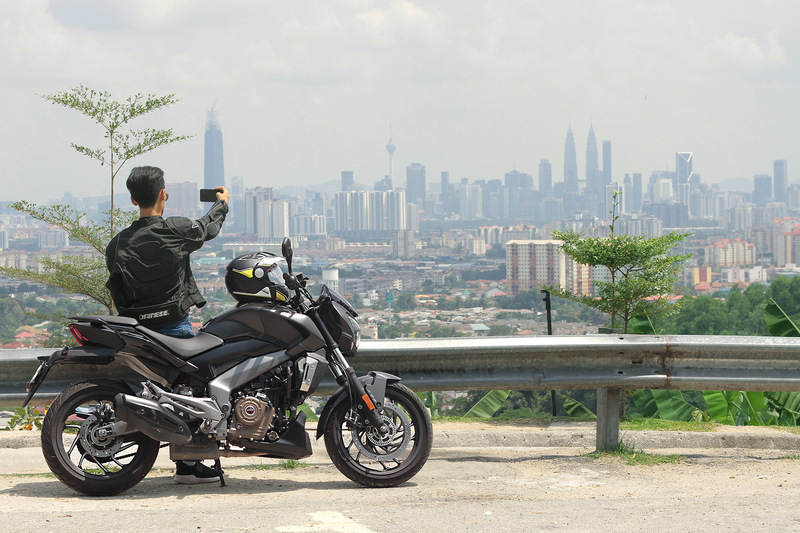 Enjoying the breath-taking scene of the magnificent KL Tower and the marvellous KLCC Twin Towers. We are reliving the journey, for rides are taken to be remembered. Our next #motography stop is at the majestic Batu Caves, one of the famous Hindu shrines outside of India. Fun fact: This giant golden statue is dedicated to Lord Murugan, the Hindu God of War. 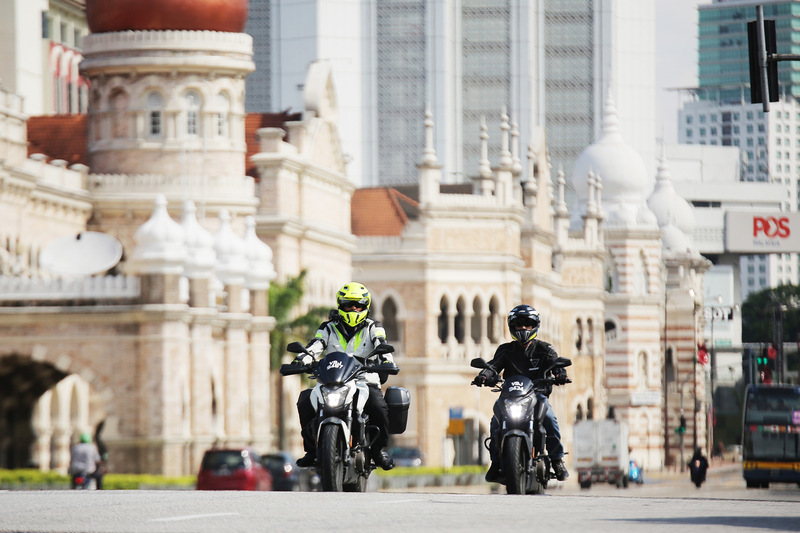 Rolling by the Sultan Abdul Samad Building in Kuala Lumpur. A monumental building located right in front of the famed Dataran Merdeka, where the Malayan flag was first raised to signify independence. 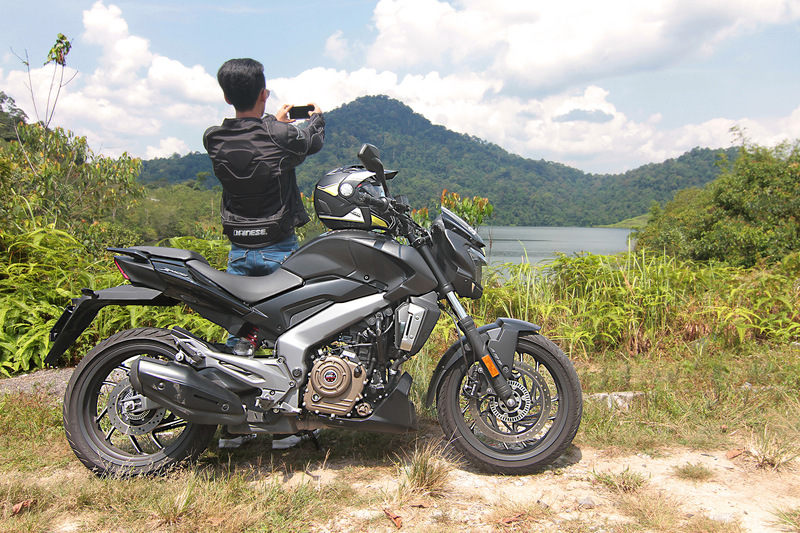 Every Malaysian motorcycle tour needs to include this national treasure! Getting our breakfast at the legendary Nasi Lemak Wanjor Kg Baru. A must try for sure! Adam was even chased by a sweet young girl in town. Ahhh…young love. We couldn’t help ourselves but to take a selfie in front of this mural. These nostalgic illustrations are drawn by the famed Malaysian cartoonist, Datuk Mohamed Noor Khalid, also known as Lat. 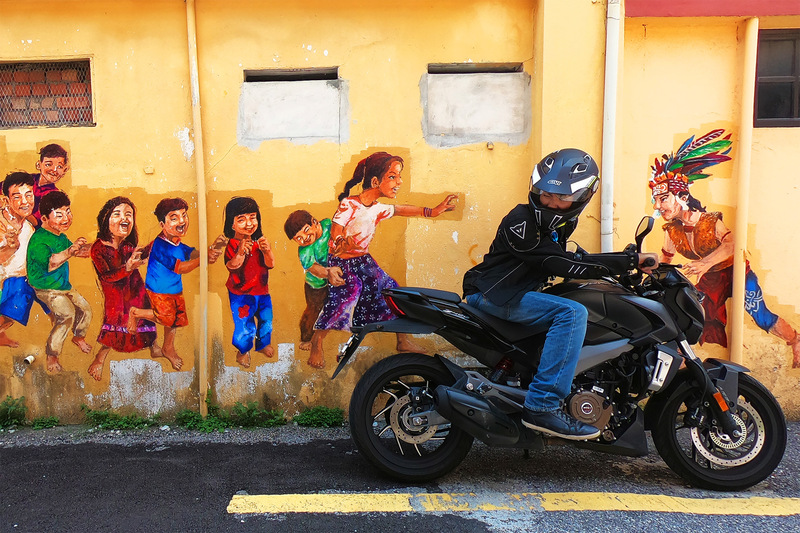 On to the next #motography location, Ipoh, the city of British colonialera architecture, limestone caves, and our favourite. You probably know this by now, but it’s FOOD! All smiles when we get these two things: Family Time and Makan Time! 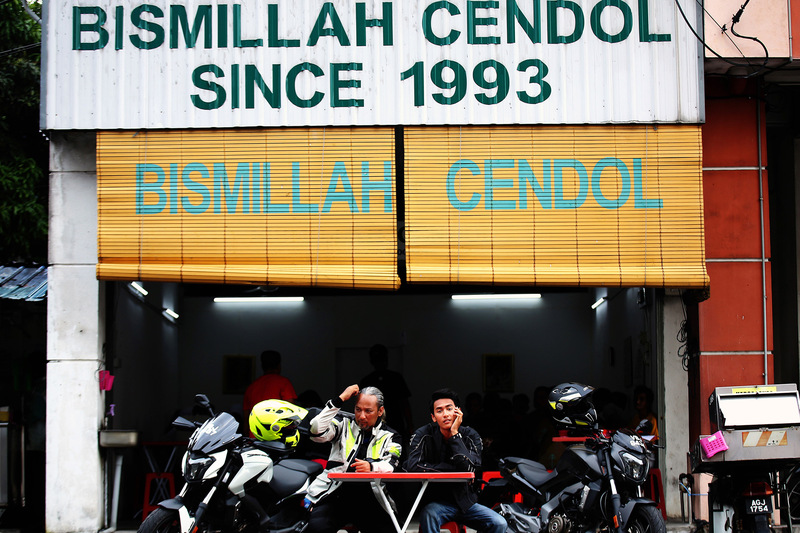 The delicious ice dessert at Bismillah Cendol in Taiping is a must try. Blessed with good taste, health, and looks since 1993. After a day in the city, the tranquil sight of Taiping Lake Garden is simply refreshing. Ipoh town is a gem filled with scenic views and peaceful surroundings. 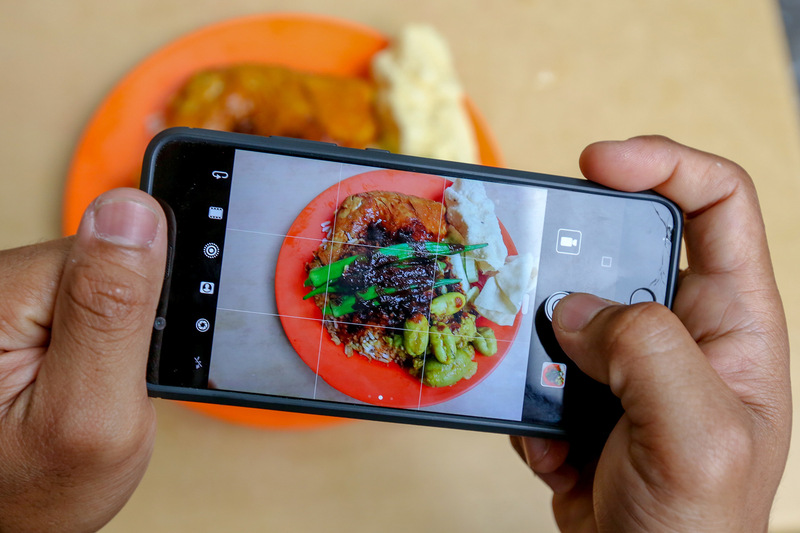 To preserve our memories at Nasi Kandar Line Clear, we took a photo of a photo of our yummy Nasi Kandar. Keep a look out for our #motography tutorials called #artofmotography. Breathtaking isn’t it? 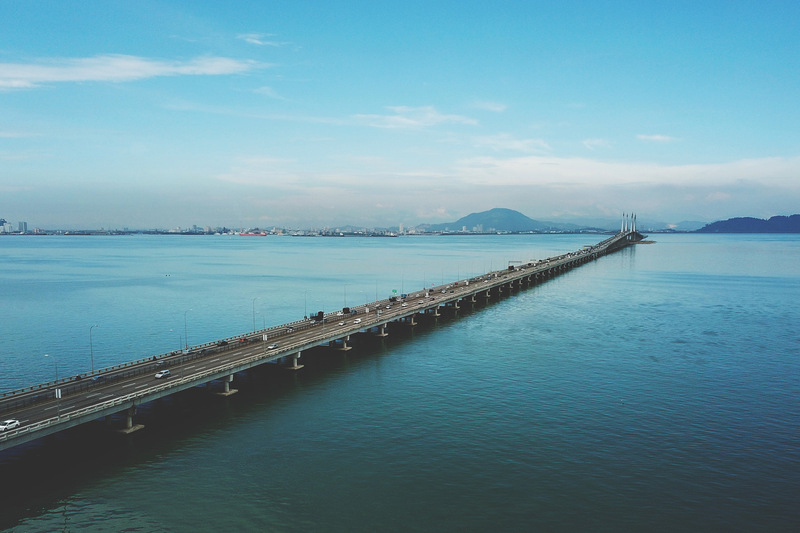 The Penang Bridge is the second-longest bridge in Malaysia and the fifth-longest in Southeast Asia. We’re on the Penang Bridge, making our way to Malaysia's second largest city. That means MORE adventures and food in store! Stay tuned! Taking a break in front of the Kangar City post office in Perlis. One son trying to be hot while the other sun is already blazing. Birds fly high, so do drones. 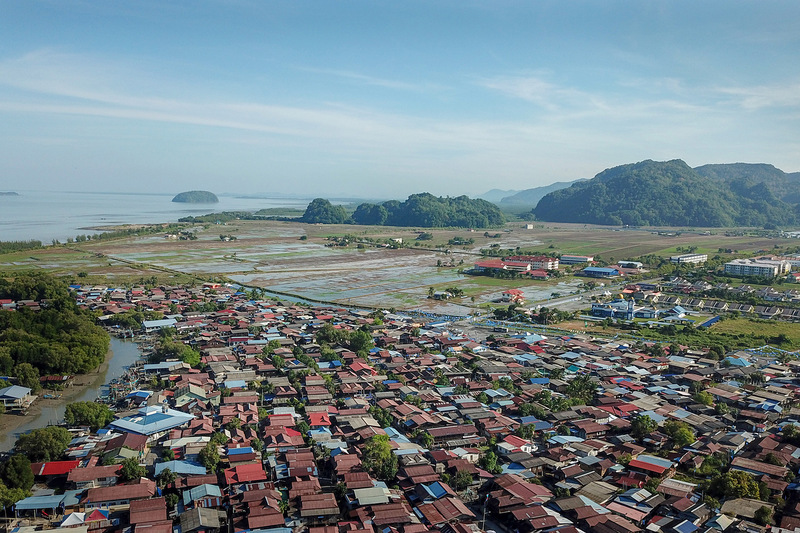 A wide scenic shot of Kampung Hujong Tanjong in Kuala Perlis brings back childhood memories. Check out our #artofmotography for more information on drones! With our bellies filled and our hearts satisfied, it’s time to take on the world! 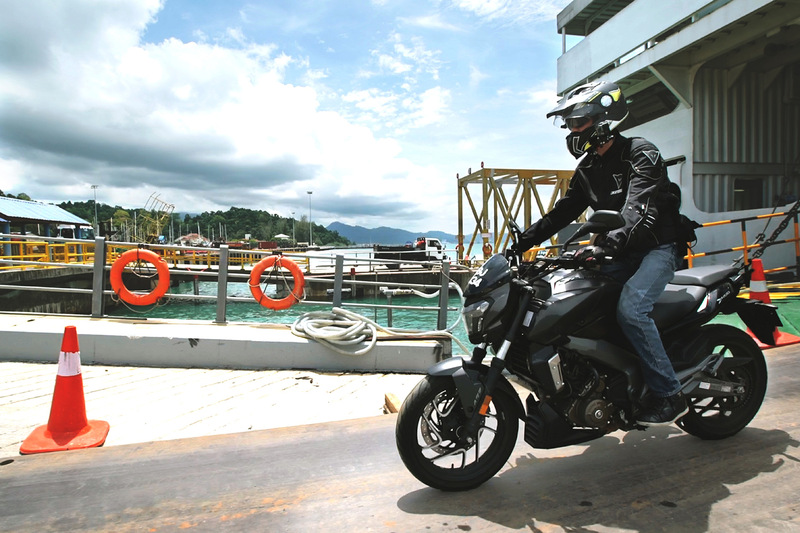 Adam’s first time transporting his bike via ferry at the Kuah Tanjung Lembung Jetty in Langkawi. 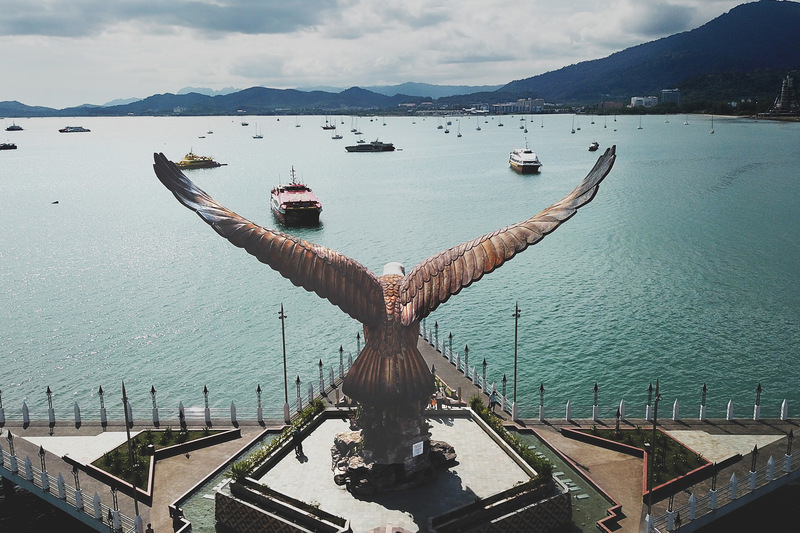 The 12-meter eagle sculpture was created to reflect the island’s name in Malay. ‘Helang’ meaning eagle and ‘Kawi’ meaning reddish brown. Hence, Langkawi. 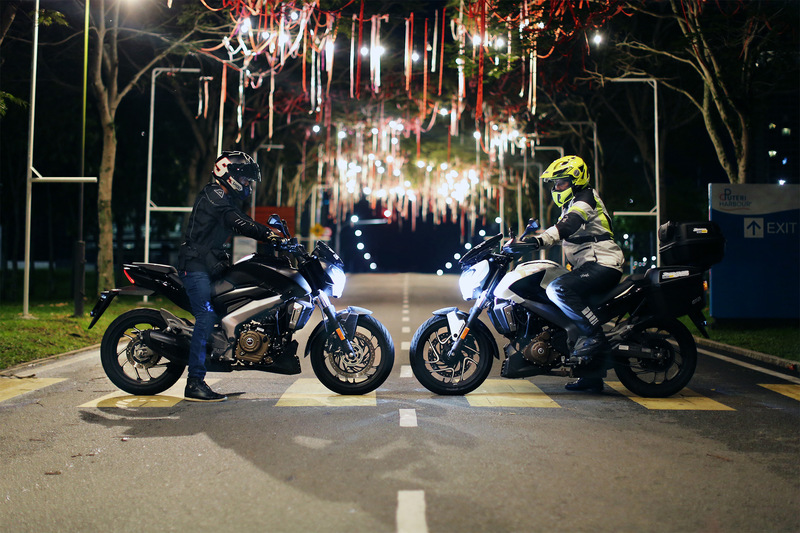 10 cities, 1300+ kilometres, and countless memorable moments later, we have arrived at the end of our father and son #motography journey. We will definitely plan more trips like this in the future. Till then, we will see you again! Right after we got off the ferry, we were greeted by this giant eagle statue at Dataran Lang. It’s one of Langkawi’s biggest and most recognisable attractions.